Yesterday we had one of our longest days, 148 miles from Golden, Colorado to Glenwood Springs, Colorado. Today we tackle the thirty-second day of our trip down the longest US-numbered route: 3,517 miles from ocean to ocean in 1962. In case you’re just tuning in, the rules of the road here on Roadtrip-‘62 TM are to try to see what’s left from 1962. We will drive on US-6 as it was in 1962, try to eat only at restaurants that existed in 1962, try to stay only at motels that existed in 1962, try to buy gas and sundries, see only attractions and generally live in America as it was in 1962! To keep the journey focused, we will only see sights within 5 miles of US-6. We don’t usually drive the freeways much, as there weren’t many freeways in 1962. But today is different, because some parts of the old road have been converted to interstate freeway. Out west where there are few roads or buildings, there is often no point in keeping two roads going to the same place. As we travel, if you see anything you like, get yourself out on the road and enjoy it in person. A virtual roadtrip like ours may be fun, but there's nothing like the real thing! At any time, click on an underlined word below to learn more about the places on the trip. Time for me to grab the wheel and go! Well, breakfast was easy, as I ate right at the Glenwood Hot Springs Lodge, where I stayed last night. I managed to get some time in the hot springs pool last night, but there are other ways to enjoy the mineral waters here. For example, Iron Mountain Hot Springs property dates back to 1896. Today it has 16 mineral hot springs, soaking pools and a freshwater family pool with a jetted spa. The Yampah Vapor Caves go back even farther. They were originally used by the Ute Indians and now you can soak in these natural steam-filled caves formed by the mineral waters. The water and steam are naturally high in sulphur, nitrate, zinc, potassium and 30 other therapeutic minerals. These caves are the only known natural vapor caves in North America. They have been a popular tourist attraction since the 1880s, when an enclosed entrance, electric lights and marble benches were added. When the railroad arrived in 1887, Glenwood Springs turned into a full-fledged tourist town. I’m not too interested in sitting in steam, but I do like caves, so lets visit the Glenwood Caverns Adventure Park. The park includes Fairy Caves, Colorado's largest showcave, which features a 40-minute tour. Some parts of the caves have been open since 1897, and today they feature replica lighting styled to match the historic Edison and Marconi light bulbs of that era. Fairy Caves was one of the first five electrically lighted caves in the country. Other parts were only discovered in the 1950s, but within two years these new sections were opened by removing close to 1000 tons of rocky debris. The park has many newer attractions above ground too, including alpine coasters, zip lines, amusement park rides, mining town village shops, and a 4D motion theater. I won’t be stopping at the Glenwood Frontier Historical Society’s museum. Though the museum is located in a historic 1905 house, it was only created in 1964, which of course is a wee bit too new for us. The museum contains artifacts and exhibits of household life, mining and ranching in the area. There are also relics from the Ute Indians, Doc Holliday, Teddy Roosevelt and Buffalo Bill Cody, all of whom spent time here. The Glenwood Railroad Museum, established in 2003, is also too new for us but the depot building it occupies is not. The historic train depot was built by the Denver & Rio Grande railroad in 1904 and is still a working Amtrak train station. The museum focuses on Glenwood Springs’ railroad history, and besides railroad artifacts, it includes a model railroad. Instead, it’s time to leave Glenwood Springs, so we head west on 6th Street, through the small downtown. As we leave Glenwood Springs, we pass many other motels, such as the Starlight Lodge, Glenwood Motor Inn, Silver Spruce Motel, and Roaring Fork Inn and Cabins, some of which look old enough to have been here in 1962. Old US-6 runs along the north side of the freeway for awhile and upon leaving town, we find the landscape has suddenly changed. Yesterday’s canyon is gone, and in its place are high but gently sloping mountains with a more or less flat top. These hillsides are mostly red rock and there are few trees. It’s mostly low scrub and I realize we’ve entered the dry side of the western United States. The Colorado River now looks like the only water in the area. The river, the freeway, the railroad and our old US-6 are all within a rather narrow valley, which is also just wide enough to hold modern shopping centers one or the other side of the river. And after the shopping and motels end, there are narrow fields which are irrigated to grow hay. Eventually, old US-6 (now a freeway frontage road) dead ends just west of Ami’s Acres Campground and I-70’s Exit 114. We’re forced to go back to freeway driving for awhile. No more civilization now; it’s just the freeway, the railroad, the river and the fantastic red rock mountain scenery! These beautiful mountains can be dangerous under the wrong conditions. Seven miles west from Glenwood Springs, we can pick up part of the old road as a freeway frontage road again, beginning at a memorial marker for the Storm King Fire of 1994. This lightning-sparked fire resulted in the deaths of 14 firefighters. The Storm King Mountain Memorial Trail at this point closely follows the path used by firefighters to access the mountain blaze. The site is just outside of New Castle, Colorado, which is one of many towns in this area that were created during the coal boom of the 1880s. New Castle is different in being one of few coal towns from that era to have survived. Coal mining was not all good news though, as the town has far too often suffered tragedy because of mining. New Castle was the location of two of Colorado’s ten worst mining disasters. The Vulcan Mine exploded in 1896, and again in 1913, both times killing over 36 miners. A third explosion in 1918 marked the end of local coal mining, but even today, the coal in the seam of the mine still burns inside the appropriately named Burning Mountain, and smoke is sometimes visible. New Castle has a small but neat downtown, with a couple of restaurants that look old but are not: New Castle Diner and Maud’s on Main. However, the New Castle Garage at the west end of town, is a real 1960s Texaco gas station that still has its old sign and paint job. It no longer sells gas, but is a repair shop and U-Haul rental business. I suspect that the old road doesn’t get a lot of traffic, which would account for both the closed gas station and the existence of the narrow bridge over Elk Creek at the west end of town. This is a pony truss bridge built in 1933. A pony truss bridge is a type of truss that is not connected from one side to the other with cross braces at the top. It is also known as a half-through truss and is generally constructed where loads are not heavy, which may account for why no modern bridge has replaced it. As we approach Silt, Colorado, the valley broadens out and the land has more agriculture. The few buildings downtown have almost no signing, giving the appearance of vacancy. Three National Forests are accessible from Silt: White River National Forest, Gunnison National Forest, and Grand Mesa National Forest. President Theodore Roosevelt is responsible for preserving the lands of all three. Because these are old National Forests, two of the oldest forest ranger stations in the United States are located south of town. But none of these forests have facilities close enough to US-6 for us to stop, so on we go. Also too new for us is the Silt Historical Park museum, which only opened in 1983. If you do stop, the park features a guided tour of restored and relocated log cabins, a schoolhouse, cow camp, country store, and tool shop. Rifle, Colorado is a regional center of the cattle ranching industry. It’s also a center for gas production, as evidenced by the large amount of industrial equipment on properties along the north side of US-6 as we approach town (and again as we leave town on the west). Recent advances in oil well drilling technology, known as fracking, have opened up the natural gas of the Piceance Basin. As a result, Colorado is now among the largest natural gas producers in the nation. But as important as this production is, what’s still underground may be bigger some day. The Book Cliffs formation here contains the richest concentration of oil shale in the world. The layers of oil shale are exposed on the sides of the cliffs west of Rifle, and this formation is visible from US-6 all the way to Price, Utah. The rock contains kerogen, which is kind of a precursor to oil that must be heated to produce oil and gas. Scientists have been experimenting with ways to extract this for over 100 years, and if they find a scalable method, there is the equivalent of more oil here than in all of the Middle East. The natural gas boom has transformed Rifle in recent years, with 4,200 new residential units being built since 2008 in a town that was only 9,000 people. The town has historically seen other booms, with vanadium mining and smelting being a major industry in the 1940s. Vanadium is often obtained as a byproduct of uranium mining. It is mainly used to produce specialty steel alloys such as needed for tools. The most important industrial vanadium compound, vanadium pentoxide, is used as a catalyst for the production of sulfuric acid. Vanadium mining began in Colorado in the 1890s, but the Rifle mine was not opened until 1922. A processing mill was also constructed in town, which operated until 1932. It was reopened in 1939 to supply the metal for steel used in World War II. Operations at the mine and mill continued until 1948, when the facilities closed again until the late 1950s. By 1960, the plant was refining both vanadium and small amounts of uranium. The need for uranium expanded by leaps and bounds during the Cold War of the 1950s: in 1950, there were only four known uranium ore finds in the United States, but by 1954, there were 25 with over 1,000 producing mines. The mining boom continued until 1958, when the The Atomic Energy Commission, which was the only uranium market in the United States, announced that no more uranium ore would be purchased from deposits that were not already developed. Our travel year of 1962 might have seen the area between booms, but other mining is still ongoing in Rifle, including sodium bicarbonate. You probably know this best as baking soda, but it is also used in many industrial processes and in personal care and drug products. Natural Soda, part of the Enirgi Group, is North America’s second largest producer of sodium bicarbonate, which is also produced commercially by chemical processes. Natural Soda mines in Rifle by injecting hot water into the nahcolite layers below ground, dissolving the nahcolite and returning the saturated brine to the plant. Pure sodium bicarbonate crystals are recovered as the hot brine is cooled. The plant seems to have been constructed about 1993, so we would not have seen it on our 1962 roadtrip. Our US-6 route bypasses the downtown, but probably used to go through it, perhaps exiting on 3rd Street. Rifle still has a small downtown, despite the recent natural gas boom. New shopping is located south of the Colorado River and includes a Walmart. Downtown includes the historic Ute Theater, now known as the New Ute Events Center. This theater was built in 1947 and the six illuminated pictures in the theatre auditorium depict the local 1940s economy. The subjects include hunting and fishing, the sheep and cattle industry, sugar beets, which were once grown in the area, and a vanadium mill. The original owner and his wife managed the theater for many years, but the City of Rifle acquired the building in 2006, when another interested buyer wanted to use it for a thrift store. By that time, the building had deteriorated and had a leaking roof, antiquated sound system, bats living inside, and of course asbestos throughout the building. After the city’s purchase, a local group was formed to rebuild the Ute to its original Art Deco architecture. It is used for public and private events including concerts, performances, films, community celebrations, and private parties. As is typical of the small towns we travel through, Rifle has a small, recent history museum. The Rifle Creek Museum is housed in the former Rifle City Hall downtown and has over twenty rooms decorated with themes based on Rifle’s history. Rifle is also home to the Garfield County Fair, which was established in 1938. If you come in August, this is a great chance to see some professional rodeos and Xtreme bull riding along with amusement rides, live music, craft artisans, and a demolition derby. You can also catch rodeo activity at many other times of the year. If I were willing to drive about 10 miles off US-6, we could visit Rifle Falls State Park. As you might expect, there is a waterfall there, but while it was originally a single falls, construction of the town’s hydroelectric plant in 1910 split it into the three 70-foot falls we could have seen in 1962 or today. But I’m not going that way, so let’s head west past the Gateway Lodge (former Winchester Motel) and the Budget Star Motel. The first is updated but preserves its western past and heritage, while the later is a remodeled older motel. The Roan Plateau dominates the western skyline of town and the Book Cliffs run parallel with us on our right side as old US-6 eventually turns into a frontage road again along I-70. The landscape becomes gradually drier, with very sparse sagebrush and pinyon-juniper vegetation by the time we get to a spot labeled Rulison on the maps, but no actual town is found at Rulison, Colorado. As I mentioned at Rifle, natural gas is extracted here. It was first developed in the 1920s and 1930s, but the few wells that were drilled then were mostly capped because there was only a small market for the product. Home heating made the gas more profitable in the 1950s and new wells were sunk here. The next town down the road is Grand Valley, Colorado, or at least it was in 1962. It was originally known as Parachute, but was changed to Grand Valley in 1908 to lure tourists in. The town was renamed back to Parachute in the 1980s, so that’s where we are today. The name of Grand Valley refers to the wide valley of the Grand River, which was the historical name of the Colorado River east of the Green River until 1921, when it too was renamed. There is almost no downtown remaining either here or in the next town, DeBeque, Colorado. Highway US-6 bypasses what little town there is by crossing a 1945 vintage bridge over the Colorado River. The history of the town is commemorated with a horse statue near the town hall and DeBeque has hosted a "Wild Horse Day" since 2000. The statue and event commemorate the wild horses that are common in the surrounding lands, which are periodically rounded up and sold. The horses live wild on federal Bureau of Land Management lands. Though they here before 1962, they were only recognized as an important feature in 1971, when the Wild and Free-Roaming Horse and Burro Act was passed to provide for management, protection and control of all unbranded and unclaimed horses and burros on public lands. Though wild horse herds live in many parts of the western United States, the Little Book Cliffs Wild Horse Area is one of only three areas in the United States set aside specifically for them. It is estimated that from 80 to 120 wild horses roam the area. The natural barriers such as cliffs and canyons control their movement, along with some supplemental fencing. Every three to four years, 20-60 wild horses are rounded up and sent for adoption through the wild horse adoption program. This helps to control herd levels. Get off the freeway or US-6 at exit 45 or exit 62 to see if you can spot some of the horses. In the spring and early summer, foals are often seen with their mothers. Or, you can bid on the current crop of horses for adoption at the Internet Adoption Program. We enter Mesa County, Colorado next, which is named for the massive mesas in the area. Grand Mesa covers approximately 500 square miles in Western Colorado, which give it the distinction of the largest flat top mountain in the world. Our concern though, is canyons. Both the railroad and the highway run along the Colorado River through several canyons, with DeBeque Canyon famous for a major landslide complex. Three significant ground movements have occurred here during the past century. The first was sometime in the late 1890s or early 1900s: the date is uncertain because there weren’t many people keeping records here then. That landslide was the largest known and it shifted the river channel and damaged the railroad on the north bank of the river. The second large movement occurred in February, 1958 when US-6 was being widened for a modern two-lane highway. The widening required cutting of the rock which destabilized the previous landslide toe, and caused the roadway to heave 23 feet vertically! Then, in April, 1998, the third major slide occurred, causing the I-70 freeway to rise 14 vertical feet and shift 5 to 6 feet sideways towards the river. So the highway is not in the same location as it was back in 1962. While driving through the canyons, we can see how difficult it was to fit the roads in here. South of town we rejoin the I-70 freeway, as there is no room for the frontage road. The westbound lanes then cross the Colorado River – twice. The eastbound lanes do not cross the river and I’m not sure which route old US-6 once took. As we enter Monument Canyon along the river, the freeway is frequently cut into the rock walls to fit: no doubt this weakened them. The river twists and turns and we even end up heading east on our westbound journey for a bit! Then, the freeway goes through a pair of tunnels and bridges at Beavertail Mountain, but old US-6 can still be used in the eastbound direction, as they left a loop of it that follows the river instead of crossing it. It’s a quiet, scenic detour that allow you to stop and park along the river, and probably provided emergency access in case of problems with either the tunnels or bridges. We also pass the Island Acres section of James M. Robb Colorado River State Park, which has five sections running from DeBeque Canyon to Fruita. The Colorado River has excellent trout fishing in the park. We leave the freeway at the north side of Palisade, Colorado and enter on old US-6. The palisades of the town’s name, classic eroded Western cliffs, are evident all around. One of first places we pass as we enter town is Mesa View Motel, an older, good-looking motel. The city limits are set pretty far out from the center, and we see a lot of small farms between houses and very few commercial properties. It appears the current US-6 is a bypass, and an older route traveled to downtown on North River Road, staying adjacent to the railroad. It’s a small, neat downtown, with Main Street ending at the mesa north of town. Palisades is also an agricultural town, as this part of the Colorado River valley is noted as a major fruit growing region and the heart of Colorado’s wine country. While the wineries are a more recent development since the 1980s, the first peach, pear, apple, cherry, plum, and grape orchards were planted around 1894. The unique high desert climate of hot days and cool nights produces especially sweet fruit, including “Palisade Peaches”, which are among the most highly praised in the state. The local festival, the Palisade Peachfest, was first celebrated in 1909 as the Peach Day festival. President William Howard Taft was the featured speaker that day. The current festival features a parade, peach eating contest, exhibits, pancake breakfast (do you notice a bias towards eating? ), and more. In 1913 the U.S. government began construction of a system of irrigation canals, building a 480-foot wide roller dam across the Colorado River. The dam is comprised of seven large steel cylinders, or rollers, hence the name. It was designed to keep the level of water behind the dam constant and prevent flooding of the nearby railroad tracks. Though the river supplied irrigation water that made farming possible, the soils in the area were high in various salts. In the early years, as irrigation occurred, the leftover water from the fields had nowhere to go but back into the ground. This caused the high salt content to leach out, creating severe alkali conditions that rendered fields unusable for crops. So much water was diverted throughout the valley that in some places the water table was only 3 feet below the surface. The Federal Bureau of Reclamation began constructing open drainage ditches to handle the excess irrigation and subsurface water and today, this drainage system consists of over 258 miles of open and piped ditch throughout the Grand Valley in Mesa County. In the center of town is Palisade Cafe. Although the current owners have only owned the restaurant for eight years, the building itself has been a cafe for over 50 years. Their country corned beef hash is a local legend, so that may be worth a stop if you’re here at lunch time. The town also has the small Palisade History Center in the old Palisades National Bank building. Among the changing window displays are fruit labels and peach picking and packing equipment. Leaving town, old US-6 to Clifton is straight through farm fields, alongside the railroad. During harvest season, which runs from late June to early October, you can stop at any of over a dozen roadside farm stands in the area. Talbott’s is a family that has been growing fruit here for nearly 100 years and Ball Fruit has been in business since 1932, so there are at least a few older establishments. Others are less than a decade old, and you will see everything from slick operations to hand-painted signs. Driving west from town, I’ll be sure to stop and pick up some fresh fruit for picnics. Clifton, Colorado is part of the Grand Junction metro area, which shows, as we hit a typical commercial shopping strip where we enter town. The Best Western Grand River Inn & Suites may be an early 1960s motel built when I-70 and the highway link to it was built. Highway US-6 currently runs north of downtown Grand Junction, Colorado, but sometime before 1960 it probably used to come in right on Main Street, using Pitkin Avenue to get there as the I-70 Business Loop does today. And US-24 would have followed us into Grand Junction back in 1962, from our meeting back in Dowd, Colorado. But today its western terminus is just a few miles from Dowd. Today, the I-70 Business Loop runs through an industrial area with the railroad. Main Street then goes through a pleasant residential area of mixed housing ages and styles to downtown. Through downtown, Main Street is no longer the major traffic route: that has been moved to a pair on one-way streets at the south edge of downtown. Main Street has recently been rebuilt as a curvy, pedestrian-friendly street with trees, parking, sculptures, and meeting spaces. The buildings have been taken over by rather cute boutique shops and offices, as the major shopping areas are now in the suburbs. In an area of older commercial buildings including a pawn shop on North Avenue, we pass Grand Rivers, an apartment and cabins complex that is surely a remodeled 1950s motel. Further down the street in an area of newer commercial development are several open older motels: the Columbine Motel, The Ipswich Inn, the Palomino Inn, and the Frontier Motor Lodge, which look good on the outside. On the other hand, the Timber Motel may be closed. This may have become motel row because of its proximity to Colorado Mesa University. A full service bakery is also nearby: Home Style Bakery has been baking breads, pies and cakes for over 65 years, just a block off US-6. I’m stopping to restock on goodies like donuts, cookies, or their specialty, cinnamon-sugar encrusted cinnamon-raisin bread. And the fast-food options include a Daylight Donuts near Lincoln Park and a Weinerschnitzel! Wienerschnitzel was founded in 1961 in Southern California, and has grown to be the world’s largest hot dog chain. It’s unlikely they were here by 1962, but it is a good choice for retro food, since they also now include the Tastee Freeze brand of ice cream treats. Tastee Freeze dates to 1950 and was founded back in Joliet, Illinois, which we passed through on Day 19 of our US-6 roadtrip. Also along North Avenue, Fabricare Corner dry cleaners has a neat old neon sign. If you stay here, this is surely a 1962-type of place to get your clothes cleaned. I’m stopping at the Wienerschnitzel for some 1962-type food! Now that lunch is over, let’s see something. The Museum of Western Colorado has its roots in 1949, when a group began collecting artifacts and building an adobe brick building to house them. Unfortunately, they never finished the building, which was begun in the Intermountain Veteran’s Memorial Park. The group reorganized in 1953 and continued collecting, but did not have a place for public display until 1966, when they re-incorporated as the Museum of Arts and Sciences and opened in the former Whitman School building. Even though we could not have seen the collection back in 1962, the items were in storage. I’m going to call that close enough and stop in to the museum today, which was moved to a remodeled warehouse in 2000. At the main museum building, you can see real firearms that outlaws used in the Thrailkill Firearms Gallery, which is one of the West’s finest collections of firearms. You can also visit a one-room schoolhouse and the Pastime saloon with its restored bar, in a recreation of a old town with wooden sidewalks. Besides the exhibits on western Colorado and traveling exhibits, today you can see plenty of information on dinosaurs at their Dinosaur Journey Museum. Back out on the streets, we find two magnificent railroad depots near a bend in old US-6 (now I-70 Business Loop), in an industrial area southwest of downtown Grand Junction. The Union Station was for sale in 2012, and Amtrak was still using the other depot. The Denver and Rio Grande Western Railroad Depot was opened on September 18, 1906, the same day of the tragic earthquake in San Francisco. Some of the first people through the depot were refugees fleeing that nearly destroyed city. Filled with doctors and volunteers, and serving food and clothing, the depot made a most magnificent refugee camp. It was designed by Chicago architect Henry J. Schlacks in the Italian Renaissance style. Details include white brick with terra cotta, a glass passenger canopy, stained-glass windows, and an interior with 22-foot ceilings. Elsewhere in Grand Junction, we find Suplizio Field. Since 1958, the JUCO (National Junior College Athletic Association) World Series has been played here. Floyd Weaver, playing for Paris Junior College of Texas in 1961, was the only player in the tournaments to go on to a Major League Baseball career in 1962, when he was a rookie for the Cleveland Indians. 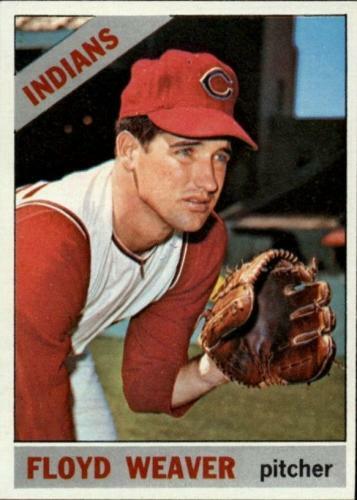 Floyd pitched for the Indians, Chicago WhiteSox, and Milwaukee Brewers through the 1971 season. Also in town, we meet highway US-50, which travels together with US-6 through the desert west of here to Ely, Nevada. Like our US-6, US-50 is a transcontinental highway. It’s currently signed as 3,073 miles from Ocean City, Maryland to West Sacramento, California, but before shortening by interstate freeways in 1972, it was 3,231 miles, running all the way west to San Francisco. In the east, it passes through Washington, DC, in view of the Capitol, Washington Monument, and more right along the Mall. In Utah and Nevada, it passes through the desert and is known as “The Loneliest Road in America.” We’ll have a chance to drive part of that section later. If we were staying for the evening, we might see a concert or play at the Avalon Theatre. As we have seen in many of the cities we have been through, Grand Junction has a beautiful theater building from the 1920s. The Avalon was built by local publishing giant Walter Walker and hosted live acts such as Harry Houdini and John Philip Sousa in its early years. In the 1940s, the Avalon was sold to the Cooper movie theater chain, and the building was remodeled. The Romanesque Revival façade was covered and the Avalon became a movie theater. In a familiar story, by the mid-1990s, it had fallen into disrepair. The City of Grand Junction was forced to take over the building in lieu of taxes. But then a local historic preservation group raised enough private funds to restore the exterior of the building. Today, The Avalon is listed on the City of Grand Junction Register of Historic Sites. I had mentioned uranium and vanadium mining back in Rifle, and this activity had an even larger impact on Grand Junction. With the building of America’s nuclear weapons arsenal during the 1950s and 1960s, mining and processing in the area became big business. In 1950, there were no mining-related industries, but just four years later there were about 75 in the area. The local offices of the Atomic Energy Commission experienced a parallel boom, from 11 employees to over 1,400 by 1954. We can see one remnant of that age by driving past site of the former Climax Uranium Mill, a decommissioned uranium mill next to the Colorado River on what was previously a sugar beet mill. About 4.5 million cubic yards of contaminated materials were removed from the site and reseeding and wetlands establishment was completed in August 1994, so we can’t see much today. Another remnant of uranium processing is underground, in the approximately 300,000 tons of radioactive uranium tailings the company gave to the city of Grand Junction for use as a construction fill material. The tailings were used in sewer and road construction from the early 1950s to 1966. My hometown of Saginaw, Michigan had a similar, but less toxic situation, as used foundry sand from metal casting operations was used as fill during that same period. It was later discovered to be toxic with heavy metal waste. In both cases, there is a lot of toxic material from 1962 and earlier hiding underground. Highway US-6 west from Grand Junction roughly follows the route of the Old Spanish Trail. Until 1821, the Grand Valley was part of the kingdom of Spain. Shortly after, Santa Fe merchant Antonio Armijo pioneered several land routes from Santa Fe, New Mexico to Los Angeles California, and the so-called North Branch runs through Grand Junction. This 2,700 mile long route was designated as part of the National Trails System Act in 2002. If we were to stay on old US-6 upon leaving town, we would pass through the mall district. The highway is 8-10 lanes, which is way more than we would have seen in 1962. There may not even have been a shopping district this far away from downtown yet, as the I-70 freeway not constructed. Behind the shopping centers, adjacent to the railroad, there are still short sections of an old 2-lane road that may have been US-6. As always, eventually the big box retail and fast food joints fade away and we would be left in the countryside on a normal roadway. Here, it’s a flat treeless countryside with bluffs on the south, and dotted with a few industries on the railroad side and car and RV dealerships on the other side of the road, until we get out to the freeway. 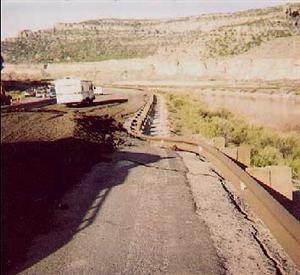 After that, US-6 and US-50 continue together on a 2-lane road adjacent to the railroad to Fruita, Colorado. But, we won’t be using US-6 because I’m driving through Colorado National Monument. Instead, we leave town on CO-340 and then take Monument Road to the park. We’ll come back to US-6 at Fruita. Colorado National Monument is one of the most scenic places in this scenic state; a sandstone ridge containing towering monoliths and red rock canyons. Because it is high above the Colorado River’s Grand Valley, there are also spectacular views of the valley. It was established in 1911 by President Taft. A National Monument is slightly different from a National Park and from time to time efforts are made to have the area redesignated. I last visited the park in 1977 and sadly, did not have time to take even a short hike. The 23-mile long Rim Rock Drive offers access to both long and short hiking trails, of which there are many. The first one we come to is Serpents Trail, a long trail which follows the route of the original road to the top of the Monument. That seems a bit long for me this afternoon, so I’ll hike the nearby Devil's Kitchen Trail, which about a mile long and ends in a sandstone grotto. Some of the longer trails include Corkscrew Trail, closed for many years but re-opened in mid-2006, Liberty Cap Trail, Ute Canyon Trail, and Monument Canyon Trail. I’ll slso try another shorter trail over near the visitor center; either Window Rock Trail or Canyon Rim Trail. Wherever you hike, it's always a good idea to follow the "Leave No Trace" principles. After our hikes, scenic drive, and a stop to read all the exhibits at the visitor center, it’s time to leave. Rim Rock Drive on the west end of the park is a twisty, steep road heading back down to the valley, which passes through two tunnels. Though scenic, it is also used by bicyclists so you have to pay close attention to the road. If you didn’t have enough canyons and rock formations at Colorado National Monument, the Black Ridge Canyon Wilderness lies southwest with over 75,000 acres containing the second largest concentration of natural arches in North America, along with fossils, pictographs and petroglyphs. There is also a twenty-five mile stretch of the Colorado River, where you can float through spectacular sandstone canyons without whitewater. There are no trailheads off old US-6, though there are some off the I-70 freeway near the Utah state line. But I don’t care to get lost in a wilderness, so it’s down to Fruita and back to US-6 for me. Fruita, Colorado is announced, as so many small towns are today, with a brand new school complex at the edge of town. The H Motel is just inside of the city, across from the Coop grain elevator, and this well-kept motel looks like it has been since at least 1962. I’ll look at downtown, though it appears US-6 never did. Downtown is a collection of well-kept, mostly single-story buildings, with a large town square. The square has been cut into a circle for traffic and contains a green concrete dinosaur on the west side. It’s just two blocks north of US-6 on Mesa Street. The Fruita area has been home to paleontological excavations since about 1900, when a Brontosaurus skeleton was found. Other finds in the area include the Fruitadens, the world's smallest known plant-eating dinosaur. Back in 1962, you could not buy alcoholic drinks here; a provision that dated from the town’s creation in 1884. A landmark near downtown is the Coop Feed Mill. Coop Country Stores have been serving the areas around Fruita, Nucla, and Palisade since 1937. The company started as a grocery store on the circle park downtown, expanding into other ventures as members required. The current fertilizer and feed mill was built in the mid-1960s. We leave on US-6 still alongside the railroad and quickly pass through a small collection of homes known as Loma, Colorado, and again at Mack, Colorado. Highway US-6 gets on the I-70 freeway here, but of course we will still go through town using the old road because the freeway wasn’t built until 1973. You can still see a few Grand Army of the Republic signs along old US-6 in this area. The railroad leaves the roadside after Mack and seeks its own way through the canyons of the Colorado River, while we head across higher country. Beyond here, it’s barren semi-desert with only one or two buildings all the way to Utah. 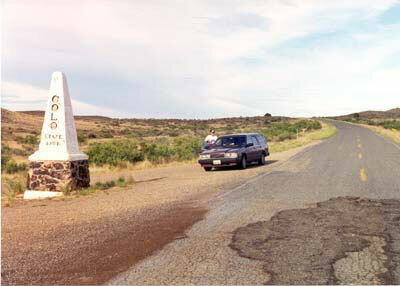 At the Utah border, there is a concrete marker on the Utah side. Nothing else marks the border except a cattle guard on the road and a barbed wire fence stretching to the horizon both north and south. Not even a sign to say Colorado is behind us. The Utah section of the road is in poor, crumbly condition without a painted centerline, as if it is expected that everyone uses the freeway. We have to rejoin the freeway at exit 227, because it appears the freeway was built right over old US-6 for the next 13 miles, to the Cicso, Utah exit. The landscape on the Utah side is the same empty, bleak one we had been traveling through at the end of Colorado. At Westwater Wash we cross the first of many bridges over a dry wash. In areas where US-6 was reconstructed onto new alignments, some of the old bridges over dry stream beds are wood timbers dating to the 1930s. Others are concrete bridges constructed around 1950, like this one. As the freeway was not yet constructed in 1962, we would have crossed all of these, as we are today. I’ve seen a lot of mining of various minerals and also oil and gas wells in Colorado, but Utah has something unique: a helium well. Actually, an entire field of wells and a helium plant to compress the gas for shipping are located about six miles west of the Utah-Colorado border. Discovered in 1925, the gas field at Harley Dome was designated “Federal Helium Reserve No. 2” by President Franklin Roosevelt in 1934. However, the field was not exploited until 2013, due to technical difficulties. The helium is actually found along with natural gas and must be separated for the natural gas to be used. The Harley Dome has an unusually high content of helium, at 7%, making it valuable. The majority of known helium-bearing natural gas sources are within the United States, with other significant sources in Canada, and Poland. Because it is chemically inert, helium has strategic and indispensable uses in many high-tech applications such as magnetic resonance imaging, semiconductor manufacturing, the US space program, and fiber optic cables. Here’s a measure of just how empty this countryside has become since we left Grand Junction. When we exit the freeway onto old US-6, which is now CO-128, the sign notes that the next services are 54 miles away, which means we won’t find any in Cisco, Utah. And that’s because Cisco is a ghost town. The town was founded in the 1880s to provide a watering stop for the Denver and Rio Grande Western Railroad's steam engines. It became a center for sheep ranching, but the land was not as good at supporting beef cattle when eating sheep declined. In 1924, oil and natural gas were discovered in the area and at one time, Cisco was the largest producer of those minerals in Utah. The town never became very large, though, balancing through the 1950s between shrinking when the railroad changed to diesel engines and no longer needed to stop here for water, and growing when discovery of uranium and vanadium in the area that drew thousands of prospectors. Cisco survived long enough to be assigned a ZIP Code, 84515, which means it was here until at least 1963. Thus, we would have seen open stores back in 1962. When the uranium boom went bust and the I-70 freeway bypassed Cisco in the 1970s, that was the end. Today, the townsite is a favorite of photographers, who love to take photos of its abandoned buildings, vehicles, and other ghost town features. It’s hard to resist driving around and looking at everything rusting and rotting away in the desert sun. Even Hollywood can’t stay away, as Cisco has been in three movies. The dramatic end of “Vanishing Point”, scenes from “Don't Come Knocking” and most recently a scene from “Thelma and Louise” were filmed here. Johnny Cash even wrote a song about a man who lived here called “Cisco Clifton's Filling Station.” Beyond here, parts of the old road, which is now an unnumbered freeway frontage road, have crumbled so badly they are gravel instead of pavement. This is where we find some of the old timber bridges over dry washes that I mentioned previously. And even though it’s so dry that hardly anything grows around here, there are tufts of grasses growing in cracks of the roadway. Further west is Thompson, Utah, which also has no retail services. In fact, Thompson is not really a town, just a small collection of homes, abandoned buildings, and mobile homes. The population from the 1960 census was 300, but only 39 were counted in the 2010 census. In the early 20th century, it was a cattle shipping point and coal mining town and the mines continued operating until about 1950. You could still catch a passenger train at the station as late as 1997, but the building is now abandoned. The building of the former Thompson Motel also still stands, but is no longer an operating motel and appears to be a storage building. One large house has an old neon sign for the Desert Moon Hotel, but it is now just a small, shady RV park. Nearby Crescent Junction, Utah is even less of a town, with no residences and just one business. The business exists because of the highway junction and freeway interchange, but the name refers to a railroad junction. The original gas station was opened in 1947, but the current two buildings were constructed in 1955 and they are still occupied by a gas station and restaurant. 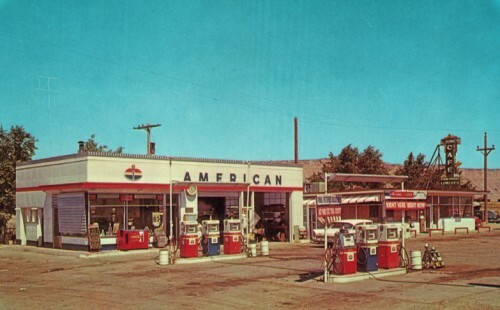 Colleen Wimmer, who publisher allowed me use her postcard of the Amoco service station, notes that her father was the original owner. Since we don’t find too many gas stations from the 1962 era that are still operating, I’ll stop here at Papa Joe’s Stop & Go for gas and maybe some ice cream at Jo Mama's restaurant! The only activity in the Crescent Junction area is an environmental cleanup site just north. In 1962, a branch rail line was extended from here to a potash mine near Moab, Utah. Also on that line was the mill of the Uranium Reduction Company, which was sold to Atlas Minerals Corporation in 1962. Atlas declared bankruptcy in 1998 and abandoned a 12 million-ton pile of radioactive mill tailings that sat just 750 feet from the Colorado River. Of course, a federal study found that radioactive uranium discharges into the Colorado River would persist indefinitely, so a cleanup was ordered. The bankruptcy meant that our tax dollars paid for the cleanup, which eventually required moving the rock away from the river to a dry land site near Crescent Junction, using that rail line. As of 2016, only 50% of the mill tailings have been moved and work is ongoing. At the highway junction, we meet US-191, which travels with us north to Moark Junction, Utah. In the other direction, Arches National Park is about 25 miles south of here. The current highway number runs from the Canadian border to Mexico, but it was originally a much shorter route. Route US-191 originally existed only in Idaho, but was relocated and extended mostly in 1981. The original number on this section of road, and in 1962, was US-160. Then, it ran from Springfield, Missouri to end here, but was shortened to end at Cortez, Clorado in 1970. The next 20 miles are through a real desert, with almost no vegetation, and what tufts there are only look green when it rains. I only saw one building along this broken-up, two-lane pavement, an energy related industry. 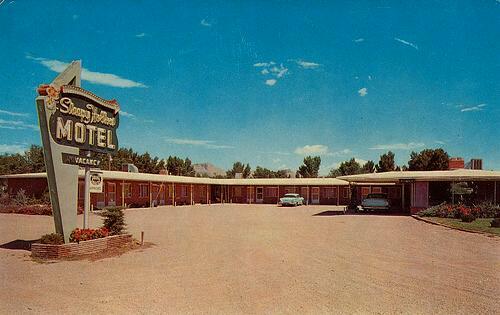 We’ll end the day in Green River, Utah, where the first thing we see is the city’s motel row. All the modern chain motels are arranged here because of the nearby freeway interchange. But this is a very newly developed part of town and these are all too new for us. We also pass the John Wesley Powell Museum out here, which was built in 1990. The museum highlights the history of Major John Wesley Powell, who led the first expedition to run the Colorado River through the Grand Canyon, and of the evolution of river boats in this region. After we cross the Green River, which is wide and so shallow that it looks like it loses more water from evaporation than it collects by rains, we enter the older part of the city. Here we find the motels that are of interest to our journey. Across from O.K. Anderson City Park, which has a rocket standing near the highway, is one older motel, the Budget Inn. 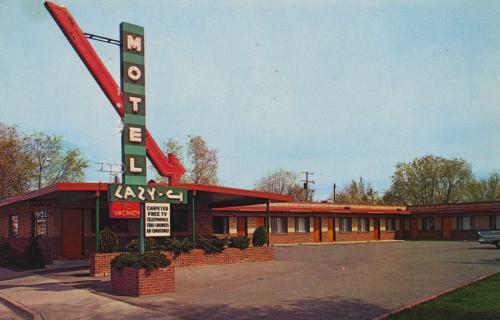 The slightly nicer looking Sleepy Hollow Motel, which boasts a nice retro neon sign, stands kitty-corner. Robbers Roost Motel, an historic building built in the 1940’s that has been a family owned and operated since, is just down the road near a downtown that is mostly empty. In fact, looking back off the main street, most of town is empty lots, too. There also a few former motels that lost the game to the newer chain motels, as witnessed by for sale signs, vacant buildings, and rusty signs. Gas stations are the same, with a lot of vacant ones and a few new ones close to the freeway. But, although businesses are sparse, there is a full range of them, with a supermarket and several cafes of most interest to us. Green River was another town that participated in the uranium mining boom of the 1940s-1960s. But the river itself is the main attraction here now, accessible right in town from Green River State Park, which opened in 1965. The river is a dry fly trout fishing paradise and also offers rafting, kayaking, and even stand-up paddletrips today. Trips are offered in both Labyrinth Canyon to the south and Desolation Canyon to the north. At least one river outfitter, Don Hatch River Expeditions, has been around since 1929, so we could have run some rapids back in 1962. The trip through Labyrinth Canyon is an easy, flat-water stretch suitable people like me who really don’t want a white-water experience. Maybe I should try that tomorrow morning! Tonight, it’s time for dinner. Ray's Tavern, downtown, was established in 1943 and is a favorite stop for both US-6 explorers like us and the hoards of Green River rafters. After a delicious dinner with homemade apple pie for desert, I’m looking for something to do before retiring for the night. Nearby Crystal Geyser is a rare example of a cold water, carbon dioxide driven geyser. This cold-water geyser is one of only fifteen of its kind in the world. It’s within my usual distance of five miles from town, though the driving distance is about 11 miles. Most geysers involve water heated deep underground to boiling temperatures, but Crystal Geyser exists because the local ground water has significant quantities of dissolved carbon dioxide and other gasses. The carbon dioxide creates enough pressure to force eruptions, sometimes as high as 130 feet. The current form of the geyser was created by an oil exploration well drilled in 1935. The area surrounding the modern geyser is covered in orange travertine deposits, and near the river are substantial deposits of white travertine, perhaps from before the well was drilled. The first written record of Crystal Geyser comes from John Wesley Powell’s expedition of 1869. If you’re not looking to drive out in the desert and you’re here in the third weekend of September, Melon Days is a festival not to be missed. An annual tradition since 1906, Melon Days celebrates Green River’s melon growing, which produces some of the best in the world due to a climate for perfect melon growing. There’s watermelon eating and seed-spitting contests, other food, and a parade with a giant melon float! They also hold square dances. I remember learning to square dance in third grade in 1962 and really enjoyed it through the next couple of years. Never did it again since I’ve been an adult, so perhaps this would be a good opportunity! Let’s see…what was a DoSaDo anyway? Oh well, I’ll see you tomorrow as Roadtrip-‘62 TM continues west through the Utah desert.